Meet us under the colonnades! Join us as we host our second Sessions in the Park Friday, September 28th from 6-8:30pm. 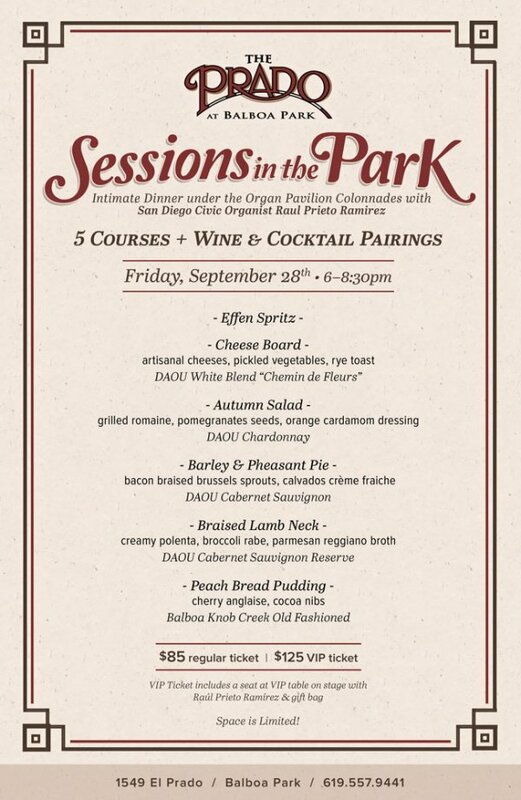 This intimate dinner will be served in a beautiful outdoor setting under the Spreckels Organ Pavilion colonnades. Enjoy a delicious 4-course menu featuring locally sourced seasonal dishes accompanied by DAOU wines and Jim Beam cocktail pairings. Guest will be greeted with a welcome cocktail accompanied with live organ playing by San Diego Civic Organist Raúl Prieto Ramírez from 6-6:30pm. Tickets for this event are priced at $85 per person. VIP Tickets are priced at $125 per person and include exclusive on-stage seating, meet and greet with Raúl Prieto Ramírez and a special gift bag. Don’t miss this unique event celebrating one of San Diego’s most historic sites! Space is limited. For additional information, please email cynthia@pradobalboa.com or call 619-557-9441.